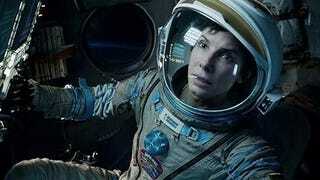 I just saw Gravity, and I have some questions. Okay, first of all, I really liked the movie. As an actress, Sandra Bullock can be kind of hit-or-miss for me, but I thought she hit it out of the park with this one. I also loved the visuals, especially the scenes meant to convey metaphor, such as when Ryan has just gotten into the ISS airlock and she just floats in place in a fetal position. And I may or may not have cried hard during the part where Ryan describes her daughter and tells Matt to say hello to her in the afterlife. Anyway, there are a few practical things from the movie that were/are really bugging me, and I don't know if it's because they are scientifically inaccurate or because I just don't know a lot about physics and space exploration. 1. So, there are at least two dead bodies left near/in the Explorer vehicle. Are those bodies just going to stay there floating or will they drift away eventually? I imagine if the movie's scenario happened in real life, those individuals' families would want their bodies back if at all possible, but are they really going to stay put? 2. I understand why a fire could break out on the ISS (because the interior has air pressure), but how come we don't see it spread to the exterior like if a house caught on fire? 3. Would the ISS, a Chinese space station and an American shuttle all really be orbiting so that you could see one craft from the other vehicles? 4. How likely is the scenario that set the plot in motion?